This is a brief history of how the company came into being and some of the people behind the scenes. I hope you don't find it too long winded. In September 1978 I bought a Suzuki 250cc motorcycle which, unbeknown to me, would change my life. I was seventeen years old and had spent a previous fourteen of them riding on old pushbikes! I luckily never joined the fizzy or AP50 crowd, and having saved up my summer Job money, went on a crusade to purchase a GSX250 or Z200. I was a sad individual at that time and wanted economy and I reckoned a top speed of 80mph would be more than adequate. North Wales wasn't known for being a Mecca for used bikes and the thought of going further a field to a young spotty teenager was terrifying. So scouring the local rags I came across a Suzuki 250 advertised for £475 in Colwyn Bay. I rang the guy up and he agreed to bring it along for me to see. Being very naive he met me and my, then, girlfriend's father (who was loaning some of the money), in the local car park at nightime! The bike appeared and it wasn't a GSX250 I thought it was, but a 250X7, a thirsty two-stroke, which was last on my practical list. However needs must and I wanted 'any bike' as quickly as possible. I was relieved of my £475 and the Suzuki was mine (and still is 28 years later)! 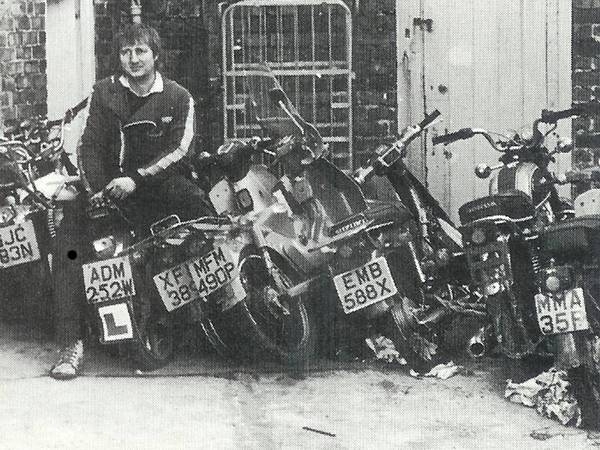 Seventeen years old, eight months to go until 'A' levels were to be sat, bikes, mates that could get into pubs, girls, ride outs and racing resulted in 3 of the worst grades my form teacher could remember! Every Polytechnic of the day treated me like a leper, I had intended to go on to further education to continue on from where the sixth form party had stopped. However the education system seemed to thwart my efforts in this direction and I needed to find a new direction. (Above) Andrew Wood 18, returning from Australia. August 1980 was decision time, no A level grades, no jobs in Britain, how could I keep the party alive? It was suggested that six months in Australia might put me straight. So my Uncle Jim was given the honour of looking after me for his sins for six months. Jim was a brickie in the Land of Oz and I became a labourer to him, not one of his best though, but the money was good! We started at six and finished at three and drank plenty of beer "to keep cool" after work. After some of the best six months of my life I had to return home, my visa ran out, to a very cold and damp Britain. Whilst I had been away a small bike shop called Abasport had got bigger and as it was opposite my mums house in Abergele I soon started to help Chris Hawley with the mail order of parts and general show help at Earls Court and various race tracks. The work was fun, I got to use my bike and also to meet a great deal of people in the industry. I remember having a stall next to M&P Accessories when they were only fifteen foot big (show stand size). Life was fun again but Chris' pay wasn't hot and pension rights weren't up for discussion. The next is truly fate for me. Next door to Abasport was a fruit and veg. shop, which wasn't doing too well. I knew the owners and their daughter Elaine (who I 'd set my personal sights on) who told me they were going to close the shop. I was mildly interested but had no money. The next fateful item, in Rhyl a large shop selling Hondas went bottoms up big style, the ensuing auction was too good to miss, so off I went to my 'Grandmas' for a capital loan of £200 (the bank laughed and thought I'd be investing In the George & Dragon). With £200 in my pocket and a bit of shrewd buying, I managed to get a lot of workshop equipment and a few damaged bikes. By this time I had negotiated a rent of £25 per week with Neville from the Tanners yard that owned the fruit and veg. shop. Over Christmas and a few dole cheques a couple of mates and myself did the shop up. I acquired a few more scrap bikes and started breaking bikes for spares. Abasport bought a few bikes from auctions, which I repaired for him and put a twelve-month ticket on and Chris sold them for a massive profit. Now I had premises, (I first started in my grandmas garage, which impressed the neighbours, not!). I decided to keep breaking bikes which at that time was profitable and the bikes that were too good to break we did up and sold, definitely the way to go I thought. On my own things were getting a bit harder, hampered by the fact that I could not drive, I didn't even own a van I had to rely on mates to pick up scrap bikes for me and that the work load was greater. A mate of mine Steve Jones joined in by helping out a day a week, the other day he would be testing soil samples! Steve's Dad 'Walt' very kindly let us store bikes for breaking at his farm, the shop was only 200sq.ft. (size of a terraced house) and we soon filled it!! Steve in the mean time was getting fed up with soil testing and Christmas '86 he gave up his full time Job and announced when we got back to work on January 2nd that he would come in full time. Money was tight but there was no shortage of work and we soon became known for repairs, rebores and race bits along with general parts. I used to go to the wholesalers in Stockport on Sunday and bring back loads of accessories and batteries to sell; Woods just took off!! Next problem, the shop was an old terraced house and the joists were (6" x 2" and over 100 yrs old) not up to the four tons of motorcycle parts on them, how we got away with it I'll never know! The building was old and started to crack we knew it was time to leave when the outside was visible through a inch wide hole in the wall we had to get out before it came down! Fate again? I happened to mention our predicament to the Accountants Ashton Hughes, he in passing mentioned about some elderly clients of his who were retiring that owned a small buildings material company in Abergele. I used to walk past the place everyday on the way to school, it used to be a truck maintenance place then. Once again the building was in a bit of a state, but quite fixable, and although in 1988, £40,000 was a vast sum it was a better bet than some of the ridiculous rents we had been asked for in the rest of Abergele, or being killed by four tons of motorcycle parts. I had thought about going into Rhyl but the new dual carriage way which passed Abergele had fed us with plenty of new clients and although the population of the town was low, people did find it easy to get here. £40,000 lighter keys in hand I realised that we had a lot of work to do, that was September 88, by Nov '88 we got plans passed and started building an extension and laid new floors. I will never forget a cold night in December laying some blocks with ‘Benny' our builder working by lamp light when up popped Santa with a collection tin, a timely reminder from our local Round Table Club! A donation was greeted with 'have a prosperous New Year'. Flat roof on, electric's finished, carpet laid, decorated and finally able to move in April 1st. 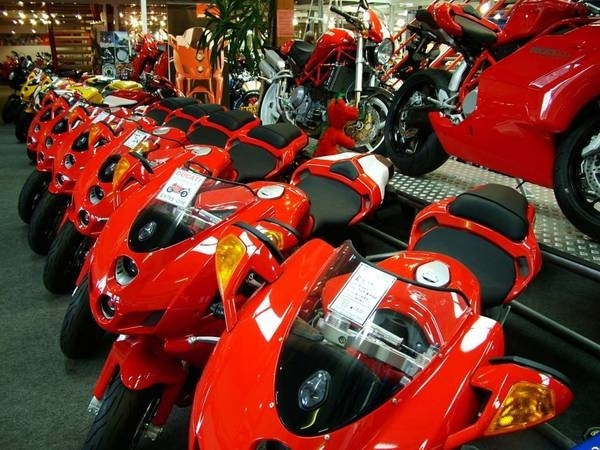 We had a showroom but no bikes for sale as we had no franchises and no used bikes, so I asked my mates to leave their bikes in the shop that week so that it looked like we had some stock! I started applying for various franchises, Japanese, BMW and Harley but no one was interested in having dealers in North Wales. Until MotoGuzzi came along. Not our first choice at that time but needless to say we got stuck in and they sold well for us! Fate strikes again! 12 miles away in Llandudno a one man band was trying to sell Ducati bikes from a converted garage in a back street, although successful in sales it wasn't what Ducati wanted and the owner, Andy Gale decided enough was enough and was going to emigrate to Canada. We were in the right time and the right place to take Ducati on, the rest is History. We were one of the first original twenty dealers, the network has changed since then in many ways as it has in numbers about forty dealers now. 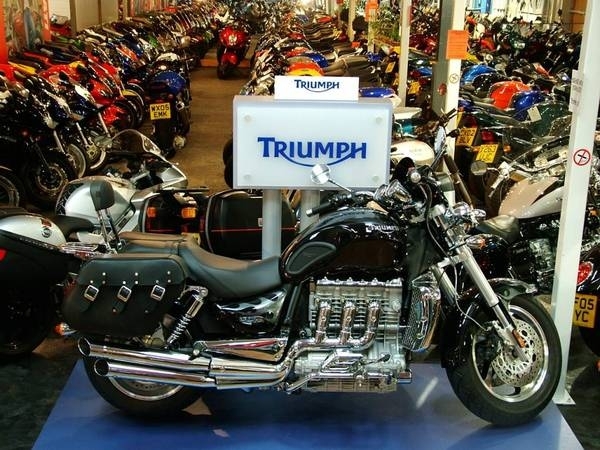 Another franchise we were after was Triumph, the new models took us and the whole world by surprise. The original dealers were handpicked and numbered twenty-five. I decided we wanted to be on the next wave of dealers that were to be taken on in 1992. This was not going to be easy as we were unknown outside North Wales, but I put together a portfolio boarded a plane to Koln Germany and went to see Bruno Tagliafari on the Triumph stand at the German Koln Show. After queuing behind lots of other potential Triumph dealers I stood in front of John Bloor's number one, handed my portfolio and requested he return it when they got back to Britain. As a back up, I wrote a letter each week, stating a reason why we should be appointed. By the fourth week they relented and invited my partner Steve and myself over to the factory. They entertained us and basically showed us how serious they were. Next Bruno from Triumph visited us. A good clean up was initiated, the dogs were brushed, the secretary had a new hairdo and a deal was struck and off we went. Three different types of machine and three different types of sales appeal, so three different types of customer, we were really heading somewhere. Sales went very well, they peaked in '95/'96 giving the headache of being so successful that we virtually burst the building. I had to put a garage at the bottom of our garden to cope with the overflow, I even had bikes in friends garages, anywhere I could put them. We had hit crisis point, even after a two hundred sq ft temporary extension upstairs. Another mini crisis happened in August '95, Steve my partner decided he wanted to have his own shop and Dave 'Judas' Ellender our salesman left to be appointed sales manager of A&D in Denbigh. Two key personnel disappearing in about six weeks! We really had to rally the troops for this one. The biggest problem was still room, this was made worse by the grateful appointment of Yamaha motorcycles to our range in September '96 another twenty bikes to put somewhere! I had asked at this time all the commercial estate agents to send details of any vacant property preferably to purchase. December '96 saw me looking around at various sites, from places in Chester to building land in Bodelwyddan but I really wanted to stay in Abergele or surrounding area. Gareth Williams one of the major commercial estate agents in North Wales sent a flyer describing a empty workshop in Peel St. I was given the key and had a look round, it had previously been used by the AA and was next to an old Coca Cola storage depot. The workshop and now sales area used to be separate buildings and one was for lease and the other for sale to add to the confusion. I went and contacted the Budge brothers who owned the site, and after serious hard negotiating (which I didn't do too well at!) a deal was struck to purchase the whole block of A1-A4 Peel St in November '97 and a commitment to another twenty years of loans, overdrafts, poverty and worry! 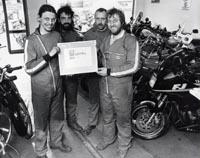 In November 1997, Dave Watson from the Council gave us a green light to change it over to a motorcycle workshop/sales centre. It's winter, quite slack in the Rhuddlan Road shop, so the troops are rallied and started to paint, brick, plumb, extend and wire the 10,000 sq ft warehouse that has been empty for six years. I set a date for 7th February 1998, but we had to extend on that and we eventually moved in on February 14th 1998. We held an official opening with my grandfather Harold, and the mayor of Abergele Carol Cooper cutting the ribbon. Over 1000 people came and went on the opening weekend. Now nine years on, we've gone from our original 85 bikes (In stock Feb ‘98) to over 210 (Feb '07), and from 9 members of staff, to 19. Also an overdraft that would have most of you constantly on vallium, but I'm still enjoying the variety of trade, the machines, and generally the warmth and friendliness of all the customers who are back and forth every week. 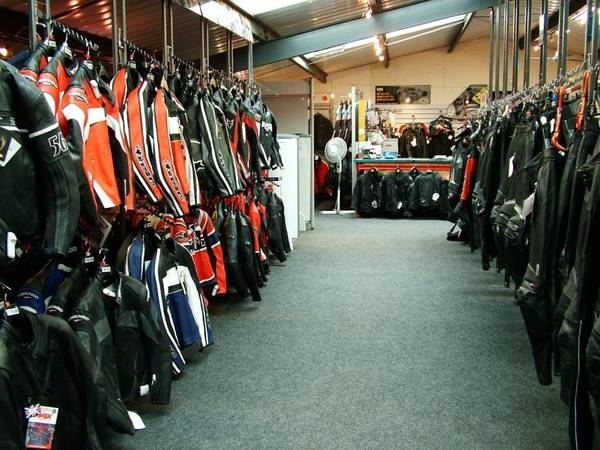 We wont be developing a chain of shops, we'll just make this one as good as possible, so we'll be here to look after you and your bike for years to come. (Above) Grand Opening 14th Feb 1998 by Harold Pearson (My Grandfather) and Carol Cooper, Abergele's Lady Mayor. (Above) Winner of Rider Power Regional "Dealer of the Year" 2007, also just announced Rider Power Regional North West/Wales "Dealer of the Year 2008"
(Above) New signage and banners completed on the outside of our 10,000 square foot motorcycle warehouse (with off road parking for over 30 cars). Feb 2008. 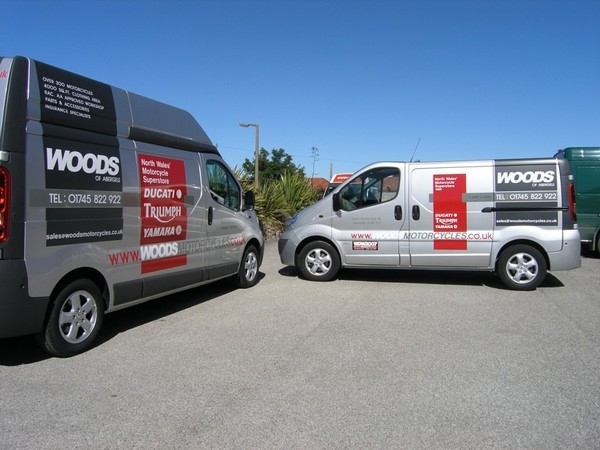 (Above) New delivery vans for 2008, supplied by Slaters, Signage by Woods and John Les Sign. Left) Enduro Africa 2007 participants, raising money for Africa via our trade partners. To date we raised and donated £18.000 towards helping Zimbabwe and the Transkies South Africa schools & village communities.